The next book in my romantic suspense series will be set in Japan. I spent almost 10 years of my adult life living there. But I still have trouble figuring out the toilets. I can’t keep up with the technology. When I first arrived in 1987, some homes and schools still had “old fashioned” toilets. There was nothing romantic about squatting over a hole atop a pit, but at least it was a simple principle to understand. Back then, the more modern facilities had western-style bathrooms with the added feature of a heated seat, something you shouldn’t knock until you try, particularly in winter. Then, sometime before I left Japan to return to the United States, the “washlet” became increasingly popular. The name says a lot, but if you’re not familiar with it, think of a bidet combined with a lot of extra features. It’s ubiquitous in Japan now. You can’t find a home, expressway rest area, department store, hotel, or restaurant without one. And they’re increasingly complex. The controls for the one in the photo are linked wirelessly with the unit. Washlets can do a lot. The seat rises automatically. It flushes automatically. It sanitizes the bowl and seat for you between uses. And for those who want, it can play the sound of rushing water when you sit down. But when the controls are in Japanese, you can get yourself into a heap of trouble! Still, to me, the washlet symbolizes all that’s terrific about Japan. Japan values cleanliness and peace, which the washlet provides in various ways for a specific function. But it’s easy to extrapolate the idea, because a lot of Japan operates on the same principle. Japanese packages have easy opening built right in. Candies and cookies are individually wrapped. You’re asked to put your cell phone on “manner” (e.g., silent) mode in public places and refrain from talking on a cell phone when others could be disturbed. Large department stores employ greeters whose main function is to greet you when you enter the building and thank you when you leave. You may be squashed together with a hundred other people in one car of a commuter train during the morning commute, but it will be a quiet, calm, and efficient experience. Let’s make life easy and effortless. Let’s all get along and help on another. A lot of Japan functions on those principles. We think about these things in the U.S. But we don’t tend to codify these ideals as a national system. We leave a lot up to individuals. But in Japan cleanliness and peace are often built right in. 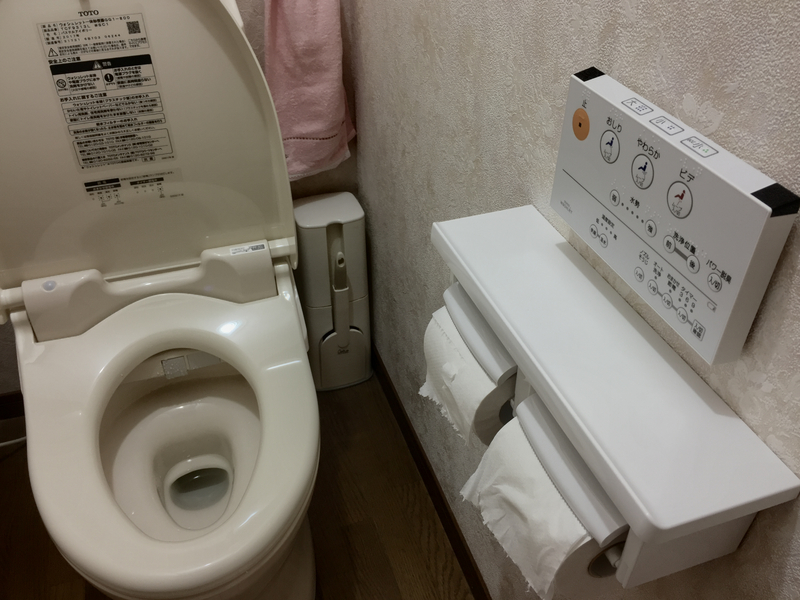 So I praise Japan and celebrate the washlet, even when I have a heck of a time figuring out the buttons.